At the time of the German invasion on 6 April 1941 (operation Marita), the Jugoslovensko Kraljjevsko Ratno Vazduhoplovstvo (JKRV - Royal Yugoslavian Air Force) flew a wide assortment and rather unique combination of aircraft. They flew among others the bombers Blenheims, Do 17Ks and S.79s. Among the fighter they flew both the Bf 109s and Hurricanes. The Fighter Force also used obsolete Hawker Furies, which equipped the 5. Lovacki puk (approx. Fighter Wing). When Germany invaded the 5. Lovacki puk were under command of Potpukovnik (Lieutenant Colonel) Leonid Badjak with the peacetime base of Medosevac airfield near Nis. The Puk consisted of two Lovacka grupa’s (approx. Fighter squadrons); 35 and 36. 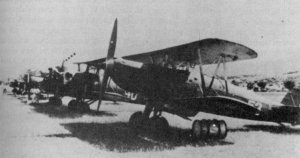 35. grupa were based at Kosancic (near Leskovac) under the command of Major (Major) Vasa Zivanovic and equipped with some 15 Hawker Fury IIs. It consisted of two Lovacka eskadrila’s (approx. Fighter flights); 109 and 110. 109. Lovacka eskadrila was under the command of Kapetan (Captain) Pavle Goldner and 110. eskadrila was under command of Kapetan Oyo Sep. The grupa was tasked with the defence of Nis and they had repeatedly attempted, without success, to intercept Luftwaffe reconnaissance aircraft violating Yugoslav airspace throughout March 1941. 36. grupa were based at Rezanovacka Kosa (near Kumanovo) under the command of Major Drago Brezovsek and equipped with another some 15 Hawker Fury IIs. It consisted of two eskadrilas; 111 and 112. 111. eskadrila was under the command of Kapetan Vojislav Popovic and 112. eskadrila was under the command of Kapetan Konstantin Jermakov. This grupa was tasked with the defence of Skopje. 5th Fighter Puk Hawker Fury No.43, seen later in April 1941 after capture by the Italians. On 6 April 36. grupa at Rezanovacka Kosa opposed the first German attacks. Two Furies were off at sunrise for a patrol towards Kratovo. The grupa had been warned before dawn to expect air raids and the rest of the grupa were strapped into their fighters with engines ticking over when some 30 Bf 109Es and Bf 110s, mainly from LG 2 and II/ZG 26, swept in to attack the airfield. Most of the Yugoslavian aircraft managed to get airborne and only one Fury, one RWD 13 and three training aircraft (BH-33Es ?) were destroyed on the ground. In the air however, the 111. eskadrila was caught at a grave disadvantage at the point of take-off, although their fate did allow 112. eskadrila pilots to gain some height before giving battle. In minutes eleven Furies, including the two on patrol, were shot down, or had been destroyed in force landing after suffering severe damage. Seven Yugoslavian pilots were killed and one was wounded, among the dead were both eskadrila commanders, Kapetan Vojislav Popovic (111. eskadrila) and Kapetan Konstantin Jermakov (112. eskadrila). 35. grupa didn’t suffer the same fate as 36. grupa, because when 20 low-flying Bf 109Es appeared over Kosancic they failed to spot the well-camouflaged Furies of 109. and 110. eskadrilas. The German fighters instead attacked the sixteen Breguet XIXs of the 2. Vazduhoplovna izvidjacka grupa (2nd Air Reconnaissance Group) of the 5th Army on nearby Sorlince airfield. The reconnaissance aircraft were mistakenly identified as Furies and claimed by the Germans as such. Only about a third of the 35. grupa pilots were present at the time of the attack, the regimental commander Pukovnik Leonid Badjak, leading off some members of 110. eskadrila in an attempt to follow the Messerschmitts back to their base. They were fired on by Yugoslav AA near Pirot, an unable to catch the German aircraft, gave up the chase. 109. eskadrila then moved to the reserve airfield at Bojnik, 15 km from Kosancic, as a precaution against further attack. On 7 April six 109. eskadrila Furies took off from Bojnik and intercepted about 20 Heinkel He 111 bombers. This engagement however had to be broken off because the Heinkel were too fast and the guns of four Furies jammed. On 8 April when the town of Bela Palanka, 75 km east of Nis, was assaulted during the afternoon, the 35. grupa Furies flew out to strafe German unit in spite of a deteriorating weather. With German amour still rapidly advancing on Nis throughout the day, the evacuation of all airfields in the area was ordered and 35. grupa prepared to evacuate to Kraljevo next morning. 35. grupa evacuated Kosancic and Bojnik on the morning of 9 April after burning all unserviceable aircraft. When they took off and broke through dense fog, the Furies were fired on by own troops in the west Morava valley. Potporucnik (Flying Officer) Pisarev carrying out an emergency landing when his Fury was hit by small arms fire. According to some sources, a second Fury was also brought down. The rest of the Furies flew on to Kraljevo. On 10 April, 35. grupa was evacuated again and moved from Kraljevo to Preljina, near Cacak after burning some damaged Furies. From here they were off again to strafe a German column near the town of Cuprija in the Morava valley, flying on to land at Sarajevo. 35. grupa was on the move again on 13 April. This time they moved to Niksic airfield. On the way there they meet twelve Italian fighters. There are no details of this engagement but both sides suffered causalities and one Fury was shot down. Still, at least seven Furies made it to Niksic. On 15 April some Furies were burned after the order not to fire on Axis aircraft anymore. Italian forces captured, when Yugoslavia unconditional surrendered on 17 April 1941, at least two Hawker Furies. Both were transported to the Centro Sperimentale of the Regia Aeronautica at Guidonia where Italian tail markings and the prize codes 43 and 53 were applied in white over the JKRV codes. Both aircraft were subsequently flown by Italian test pilots. 35 Grupa Fury, No.53, lined up together with other aircraft at the cessation of hostilities. No. 53 was the last licence-built Yugoslavian Fury to be manufactured.